The list of incompatible chemicals that are known to directly attack and chemically degrade a polymer are easily found in a supplier's product datasheet. But, in the field, it is not always possible to anticipate or protect from exposure to the unknown. So what happens when a plastic component is exposed to a wide range of chemical agents in the environment and fails prematurely? Lucideon was presented with this very scenario: an injection molded component was failing catastrophically during use and it was not clear why this was occurring. Manufacturing was suspended, the component was back ordered and the client was losing money every day that the component could not be supplied. Failed components were sent to Lucideon for analysis. 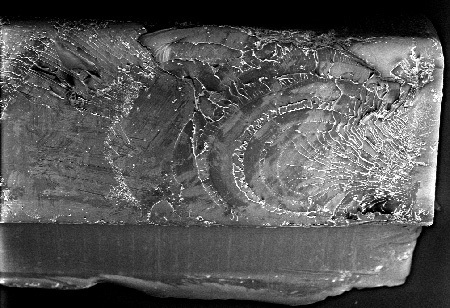 Optical Microscopy and Scanning Electron Microscopy (SEM) revealed that the component had failed in a brittle manner. Since a timely root cause analysis was required, our polymer scientists proposed a broad spectrum of techniques to probe the thermal and chemical properties of the polymer component. However, it was the use of a powerful surface science technique, Time-of-Flight Secondary Ion Mass Spectroscopy (ToF-SIMS), that provided the insight necessary to bind the evidence together and identify a root cause. With its part-per-billion (ppb) resolution, ToF-SIMS was able to detect a wide range of ultra-low concentration surface contaminants on the component and fracture surfaces. One contaminant, that stood out in particular, was identified along the fracture surfaces but, unlike other contaminants, it was found nowhere else on the component. The chemical was dioctylphthalate (DOP), a common plasticizer used to make plastic packaging and tubing more flexible. While not a primary chemical agent that will directly attack polymer chains, DOP is weakly bound and highly mobile. Therefore, in the presence of internal stresses, defects or initial cracks, DOP or other low molecular weight chemical agents can extend cracks by localized plasticization. This failure mechanism is commonly referred to as environmental stress cracking (ESC) and it leads to premature and often unexpected, rapid, brittle failure. Lucideon went above and beyond the initial failure analysis by performing experiments confirming that the plastic component was in-fact susceptible to ESC in the presence of internal stress and DOP. Subsequently, solutions to reduce residual stress in components and protect them from sources of DOP were established. Ultimately, the ability to provide both a failure analysis and appropriate corrective actions in a timely fashion prevented further delays and allowed our client to continue serving their customers.